Enjoy a magical walk through Barcelona's historic quarter with your family, accompanied by songs, dances, legends and stories. 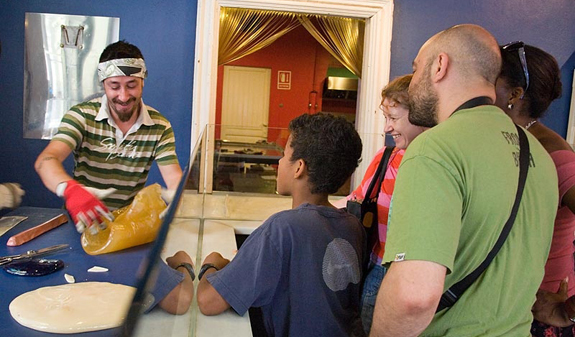 Have fun on this tour while you learn… you'll even be able to sample delicious sweets. Sometimes we're reminded how exciting the world was as a child when we're with our own children. 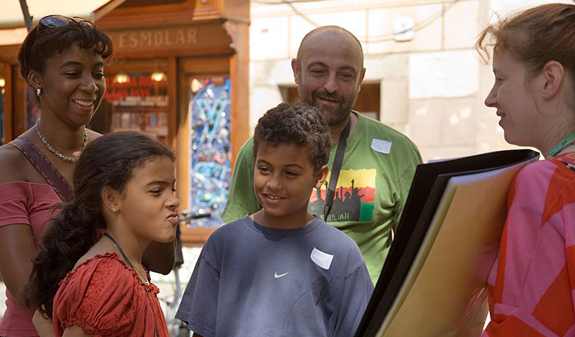 That's why we invite you and your family to discover Barcelona as never before by visiting some of the truly amazing places in the city's historic quarter, accompanied by songs, workshops and games. The tour begins with a delicious welcome at the confectioners and cake shop La Colmena, which has been making traditional confectionery since 1843. 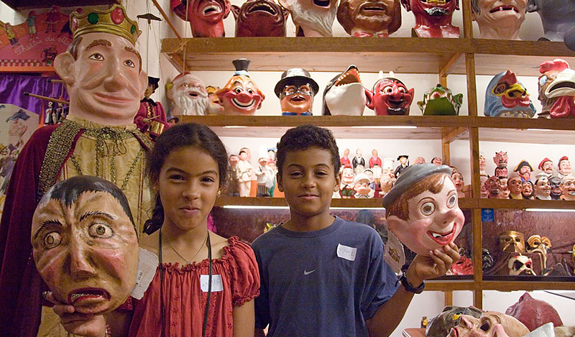 Next you'll visit the Museu dels Gegants, a shrine to Catalan dance and festivals. As you explore the streets you'll find relics from Roman and medieval times, such as stretches of the large Roman columns which are tucked away in a number of the city streets.You'll walk through the bohemian plaça del Pi, surrounded by art and life. 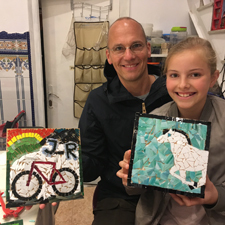 And then its back to magic at the toy workshop Ingenio where colours and imagination will take you back to far-off times. After walking through major squares and streets, you'll discover the Roman columns at the ancient Temple of Augustus, and, when possible, you'll be able to sample some of the hand-made sweets at the ingenious sweet shop Papabubble. 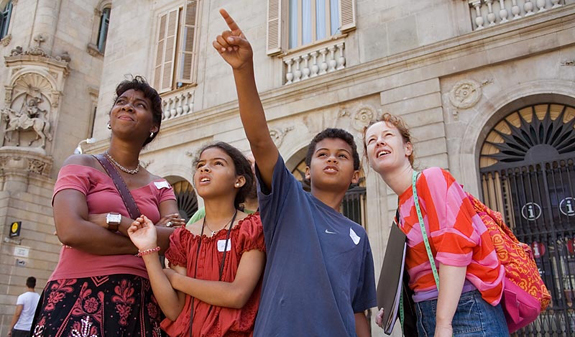 Guided tour of the different places of interest, accompanied by games, illustrated legends and songs about the history and traditions of the area which have been specially designed to be enjoyed by the family and to help you learn about Barcelona. 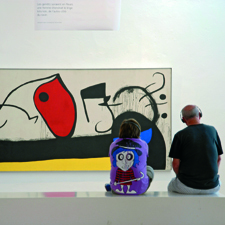 Times: from 15th March to 30th June, and from 1st September to 31st October: Saturdays at 10am. / from 1st July to 31st August: Wednesdays and Saturdays at 10am. Closed: from 1st November to 14th March. Meeting point: Via Laietana (pl. de l’Àngel, 12, in front of the Suizo hotel). Metro: L4, Jaume I stop. 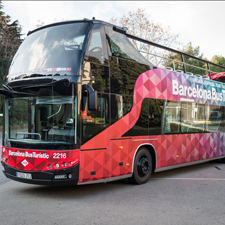 Bus: 14, 17, 45, 59, 91 and V17. All children must be accompanied by an adult and vice versa. Recommended for families with children 4-12 years old. Groups of minimum 2 and maximum 20 people.